This new hands-on learning experience gives participants an opportunity to make bread, butter, pasta and ice-cream as well as learn about preservation and cheese making in our Food Factory Tent. The experience is rounded off by a visit to York Cocoa Works for a chocolaty activity and to learn about chocolate manafactuary. Andrew Pern, Michelin starred Yorkshire Chef, is opening an exciting new pop up street food and bar stand at this year’s Festival. Located at the Food Hub, you’ll find Andrew and his team serving ‘Michelin starred’ street food throughout the Festival. 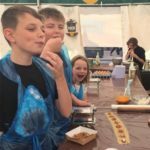 Taking a lead from the “Slow Food” movement the Festivals new “Taste Workshops” are an opportunity to learn more about local produce from producers, specialists and experts. Spark, which opened in March this year, extends the festivals street food offer and will host a number of special events and workshops during the Festival.